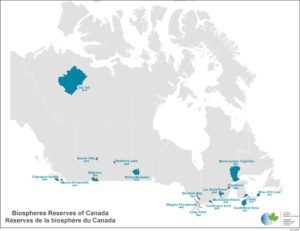 Check out our videos, newsletters and educational resources which are available for downloading or link to any of the 18 Canadian UNESCO Biospheres. Launched in 1971, UNESCO’s Man and the Biosphere Programme (MAB) is an Intergovernmental Scientific Programme that aims to establish a scientific basis for the improvement of relationships between people and their environments. Learn more about UNESCO’s Man and the Biosphere here.